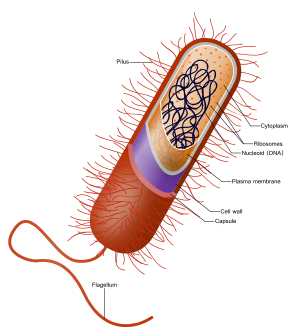 A diagram of a typical prokaryotic bacteria cell. A prokaryote is a unicellular organism that lacks a membrane-bound nucleus (karyon), mitochondria, or any other membrane-bound organelle. The word prokaryote comes from the Greek πρό (pro) "before" and καρυόν (karyon) "nut or kernel". Prokaryotes can be divided into two domains, Archaea and bacteria. In contrast, species with nuclei and organelles are placed in the domain Eukaryota. In the prokaryotes, all the intracellular water-soluble components (proteins, DNA and metabolites) are located together in the cytoplasm enclosed by the cell membrane, rather than in separate cellular compartments. Bacteria, however, do possess protein-based bacterial microcompartments, which are thought to act as primitive organelles enclosed in protein shells. Some prokaryotes, such as cyanobacteria may form large colonies. Others, such as myxobacteria, have multicellular stages in their life cycles. Molecular studies have provided insight into the evolution and interrelationships of the three domains of biological species. Eukaryotes are organisms, including humans, whose cells have a well defined membrane-bound nucleus (containing chromosomal DNA) and organelles. The division between prokaryotes and eukaryotes reflects the existence of two very different levels of cellular organization. Distinctive types of prokaryotes include extremophiles and methanogens; these are common in some extreme environments. Prokaryotes have a prokaryotic cytoskeleton, albeit more primitive than that of the eukaryotes. Besides homologues of actin and tubulin (MreB and FtsZ), the helically arranged building-block of the flagellum, flagellin, is one of the most significant cytoskeletal proteins of bacteria, as it provides structural backgrounds of chemotaxis, the basic cell physiological response of bacteria. At least some prokaryotes also contain intracellular structures that can be seen as primitive organelles. Membranous organelles (or intracellular membranes) are known in some groups of prokaryotes, such as vacuoles or membrane systems devoted to special metabolic properties, such as photosynthesis or chemolithotrophy. In addition, some species also contain carbohydrate-enclosed microcompartments, which have distinct physiological roles (e.g. carboxysomes or gas vacuoles). Most prokaryotes are between 1 µm and 10 µm, but they can vary in size from 0.2 µm (Mycoplasma genitalium) to 750 µm (Thiomargarita namibiensis). Long, whip-like protrusion that aids cellular locomotion. Surrounds the cell's cytoplasm and regulates the flow of substances in and out of the cell. Outer covering of most cells that protects the bacterial cell and gives it shape. A gel-like substance composed mainly of water that also contains enzymes, salts, cell components, and various organic molecules. Cell structures responsible for protein production. Area of the cytoplasm that contains the single bacterial DNA molecule. A glycoprotein-polysaccharide covering that surrounds the cell membranes. The archaeon Haloquadratum has flat square-shaped cells. Bacteria and archaea reproduce through asexual reproduction, usually by binary fission. Genetic exchange and recombination still occur, but this is a form of horizontal gene transfer and is not a replicative process, simply involving the transference of DNA between two cells, as in bacterial conjugation. DNA transfer between prokaryotic cells occurs in bacteria and archaea, although it has been mainly studied in bacteria. In bacteria, gene transfer occurs by three processes. These are (1) bacterial virus (bacteriophage)-mediated transduction, (2) plasmid-mediated conjugation, and (3) natural transformation. Transduction of bacterial genes by bacteriophage appears to reflect an occasional error during intracellular assembly of virus particles, rather than an adaptation of the host bacteria. The transfer of bacterial DNA is under the control of the bacteriophage’s genes rather than bacterial genes. Conjugation in the well-studied E. coli system is controlled by plasmid genes, and is an adaptation for distributing copies of a plasmid from one bacterial host to another. Infrequently during this process, a plasmid may integrate into the host bacterial chromosome, and subsequently transfer part of the host bacterial DNA to another bacterium. Plasmid mediated transfer of host bacterial DNA (conjugation) also appears to be an accidental process rather than a bacterial adaptation. Natural bacterial transformation involves the transfer of DNA from one bacterium to another through the intervening medium. Unlike transduction and conjugation, transformation is clearly a bacterial adaptation for DNA transfer, because it depends on numerous bacterial gene products that specifically interact to perform this complex process. For a bacterium to bind, take up and recombine donor DNA into its own chromosome, it must first enter a special physiological state called competence. About 40 genes are required in Bacillus subtilis for the development of competence. The length of DNA transferred during B. subtilis transformation can be as much as a third to the whole chromosome. Transformation is a common mode of DNA transfer, and 67 prokaryotic species are thus far known to be naturally competent for transformation. Among archaea, Halobacterium volcanii forms cytoplasmic bridges between cells that appear to be used for transfer of DNA from one cell to another. Another archaeon, Sulfolobus solfataricus, transfers DNA between cells by direct contact. Frols et al. found that exposure of S. solfataricus to DNA damaging agents induces cellular aggregation, and suggested that cellular aggregation may enhance DNA transfer among cells to provide increased repair of damaged DNA via homologous recombination. While prokaryotes are considered strictly unicellular, most can form stable aggregate communities. When such communities are encased in a stabilizing polymer matrix ("slime"), they may be called "biofilms". Cells in biofilms often show distinct patterns of gene expression (phenotypic differentiation) in time and space. Also, as with multicellular eukaryotes, these changes in expression often appear to result from cell-to-cell signaling, a phenomenon known as quorum sensing. Biofilms may be highly heterogeneous and structurally complex and may attach to solid surfaces, or exist at liquid-air interfaces, or potentially even liquid-liquid interfaces. Bacterial biofilms are often made up of microcolonies (approximately dome-shaped masses of bacteria and matrix) separated by "voids" through which the medium (e.g., water) may flow easily. The microcolonies may join together above the substratum to form a continuous layer, closing the network of channels separating microcolonies. This structural complexity—combined with observations that oxygen limitation (a ubiquitous challenge for anything growing in size beyond the scale of diffusion) is at least partially eased by movement of medium throughout the biofilm—has led some to speculate that this may constitute a circulatory system  and many researchers have started calling prokaryotic communities multicellular (for example ). Differential cell expression, collective behavior, signaling, programmed cell death, and (in some cases) discrete biological dispersal events all seem to point in this direction. However, these colonies are seldom if ever founded by a single founder (in the way that animals and plants are founded by single cells), which presents a number of theoretical issues. Most explanations of co-operation and the evolution of multicellularity have focused on high relatedness between members of a group (or colony, or whole organism). If a copy of a gene is present in all members of a group, behaviors that promote cooperation between members may permit those members to have (on average) greater fitness than a similar group of selfish individuals (see inclusive fitness and Hamilton's rule). Should these instances of prokaryotic sociality prove to be the rule rather than the exception, it would have serious implications for the way we view prokaryotes in general, and the way we deal with them in medicine. Bacterial biofilms may be 100 times more resistant to antibiotics than free-living unicells and may be nearly impossible to remove from surfaces once they have colonized them. Other aspects of bacterial cooperation—such as bacterial conjugation and quorum-sensing-mediated pathogenicity, present additional challenges to researchers and medical professionals seeking to treat the associated diseases. Prokaryotes have diversified greatly throughout their long existence. The metabolism of prokaryotes is far more varied than that of eukaryotes, leading to many highly distinct prokaryotic types. For example, in addition to using photosynthesis or organic compounds for energy, as eukaryotes do, prokaryotes may obtain energy from inorganic compounds such as hydrogen sulfide. This enables prokaryotes to thrive in harsh environments as cold as the snow surface of Antarctica, studied in cryobiology or as hot as undersea hydrothermal vents and land-based hot springs. Prokaryotes live in nearly all environments on Earth. Some archaea and bacteria thrive in harsh conditions, such as high temperatures (thermophiles) or high salinity (halophiles). Organisms such as these are referred to as extremophiles. Many archaea grow as plankton in the oceans. Symbiotic prokaryotes live in or on the bodies of other organisms, including humans. In 1977, Carl Woese proposed dividing prokaryotes into the Bacteria and Archaea (originally Eubacteria and Archaebacteria) because of the major differences in the structure and genetics between the two groups of organisms. Archaea were originally thought to be extremophiles, living only in inhospitable conditions such as extremes of temperature, pH, and radiation but have since been found in all types of habitats. 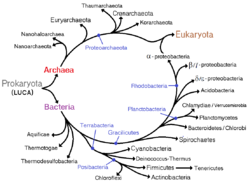 The resulting arrangement of Eukaryota (also called "Eukarya"), Bacteria, and Archaea is called the three-domain system, replacing the traditional two-empire system. One criticism of the dichotomous prokaryote-eukaryote distinction points out that the word "prokaryote" is based on what these organisms are not (they are not eukaryotic), rather than what they are (either archaea or bacteria). The current model of the evolution of the first living organisms is that these were some form of prokaryotes, which may have evolved out of protocells. In general, the eukaryotes are thought to have evolved later in the history of life. However, some authors have questioned this conclusion, arguing that the current set of prokaryotic species may have evolved from more complex eukaryotic ancestors through a process of simplification. Others have argued that the three domains of life arose simultaneously, from a set of varied cells that formed a single gene pool. The oldest known fossilized prokaryotes were laid down approximately 3.5 billion years ago, only about 1 billion years after the formation of the Earth's crust. Eukaryotes only appear in the fossil record later, and may have formed from endosymbiosis of multiple prokaryote ancestors. The oldest known fossil eukaryotes are about 1.7 billion years old. However, some genetic evidence suggests eukaryotes appeared as early as 3 billion years ago. While Earth is the only place in the universe where life is known to exist, some have suggested that there is evidence on Mars of fossil or living prokaryotes. However, this possibility remains the subject of considerable debate and skepticism. The division between prokaryotes and eukaryotes is usually considered the most important distinction or difference among organisms. The distinction is that eukaryotic cells have a "true" nucleus containing their DNA, whereas prokaryotic cells do not have a nucleus. Both eukaryotes and prokaryotes contain large RNA/protein structures called ribosomes, which produce protein. Another difference is that ribosomes in prokaryotes are smaller than in eukaryotes. However, two organelles found in many eukaryotic cells, mitochondria and chloroplasts, contain ribosomes similar in size and makeup to those found in prokaryotes. This is one of many pieces of evidence that mitochondria and chloroplasts are themselves descended from free-living bacteria. This theory holds that early eukaryotic cells took in primitive prokaryotic cells by phagocytosis and adapted themselves to incorporate their structures, leading to the mitochondria we see today. The genome in a prokaryote is held within a DNA/protein complex in the cytosol called the nucleoid, which lacks a nuclear envelope. The complex contains a single, cyclic, double-stranded molecule of stable chromosomal DNA, in contrast to the multiple linear, compact, highly organized chromosomes found in eukaryotic cells. In addition, many important genes of prokaryotes are stored in separate circular DNA structures called plasmids. Prokaryotes lack mitochondria and chloroplasts. Instead, processes such as oxidative phosphorylation and photosynthesis take place across the prokaryotic cell membrane. However, prokaryotes do possess some internal structures, such as prokaryotic cytoskeletons. It has been suggested that the bacterial order Planctomycetes have a membrane around their nucleoid and contain other membrane-bound cellular structures. However, further investigation revealed that Planctomycetes cells are not compartmentalized or nucleated and like the other bacterial membrane systems are all interconnected. Prokaryotic cells are usually much smaller than eukaryotic cells. Therefore, prokaryotes have a larger surface-area-to-volume ratio, giving them a higher metabolic rate, a higher growth rate, and as a consequence, a shorter generation time than eukaryotes. ^ a b NC State University. "Prokaryotes: Single-celled Organisms". ^ "prokaryote". Online Etymology Dictionary. ^ Kerfeld, C. A.; Sawaya, M. R; Tanaka, S; Nguyen, C. V.; et al. (5 August 2005). "Protein structures forming the shell of primitive bacterial organelles.". Science. 309 (5736): 936–8. Bibcode:2005Sci...309..936K. doi:10.1126/science.1113397. PMID 16081736. ^ Dorothee Murat; Meghan Byrne & Arash Komeili (October 2010). "Cell Biology of Prokaryotic Organelles". Cold Spring Harb Perspect Biol. 2: a000422. doi:10.1101/cshperspect.a000422. PMC 2944366 . PMID 20739411. ^ Kaiser D (October 2003). "Coupling cell movement to multicellular development in myxobacteria". Nat. Rev. Microbiol. 1 (1): 45–54. doi:10.1038/nrmicro733. PMID 15040179. ^ Stoeckenius W (1 October 1981). "Walsby's square bacterium: fine structure of an orthogonal procaryote". J. Bacteriol. 148 (1): 352–60. PMC 216199 . PMID 7287626. ^ Chen I; Dubnau D (March 2004). "DNA uptake during bacterial transformation". Nat. Rev. Microbiol. 2 (3): 241–9. doi:10.1038/nrmicro844. PMID 15083159. ^ Solomon JM; Grossman AD (April 1996). "Who's competent and when: regulation of natural genetic competence in bacteria". Trends Genet. 12 (4): 150–5. doi:10.1016/0168-9525(96)10014-7. PMID 8901420. ^ Akamatsu T; Taguchi H (April 2001). "Incorporation of the whole chromosomal DNA in protoplast lysates into competent cells of Bacillus subtilis". Biosci. Biotechnol. Biochem. 65 (4): 823–9. doi:10.1271/bbb.65.823. PMID 11388459. ^ Saito Y; Taguchi H; Akamatsu T (March 2006). "Fate of transforming bacterial genome following incorporation into competent cells of Bacillus subtilis: a continuous length of incorporated DNA". J. Biosci. Bioeng. 101 (3): 257–62. doi:10.1263/jbb.101.257. PMID 16716928. ^ Johnsborg O; Eldholm V; Håvarstein LS (December 2007). "Natural genetic transformation: prevalence, mechanisms and function". Res. Microbiol. 158 (10): 767–78. doi:10.1016/j.resmic.2007.09.004. PMID 17997281. ^ Rosenshine I; Tchelet R; Mevarech M (September 1989). "The mechanism of DNA transfer in the mating system of an archaebacterium". Science. 245 (4924): 1387–9. Bibcode:1989Sci...245.1387R. doi:10.1126/science.2818746. PMID 2818746. ^ Fröls S; Ajon M; Wagner M; et al. (November 2008). "UV-inducible cellular aggregation of the hyperthermophilic archaeon Sulfolobus solfataricus is mediated by pili formation". Mol. Microbiol. 70 (4): 938–52. doi:10.1111/j.1365-2958.2008.06459.x. PMID 18990182. ^ "Direct Observations". The Biofilm Primer. Springer Series on Biofilms. 1. 2007. pp. 3–4. doi:10.1007/978-3-540-68022-2_2. ISBN 978-3-540-68021-5. ^ Costerton JW; Lewandowski Z; Caldwell DE; Korber DR; et al. (1995). "Microbial biofilms". Annu. Rev. Microbiol. 49: 711–45. doi:10.1146/annurev.mi.49.100195.003431. PMID 8561477. ^ Shapiro JA (1998). "Thinking about bacterial populations as multicellular organisms" (PDF). Annu. Rev. Microbiol. 52: 81–104. doi:10.1146/annurev.micro.52.1.81. PMID 9891794. ^ Chua SL, Liu Y, Yam JK, Tolker-Nielsen T, Kjelleberg S, Givskov M, Yang L (2014). "Dispersed cells represent a distinct stage in the transition from bacterial biofilm to planktonic lifestyles". Nature Communications. 5: 4462. doi:10.1038/ncomms5462. PMID 25042103. ^ Hamilton WD (July 1964). "The genetical evolution of social behaviour. II". J. Theor. Biol. 7 (1): 17–52. doi:10.1016/0022-5193(64)90039-6. PMID 5875340. ^ Balaban, N.; Ren, D.; Givskov, M.; Rasmussen, T. B. (2008). "Introduction". Control of Biofilm Infections by Signal Manipulation. Springer Series on Biofilms. 2. p. 1. doi:10.1007/7142_2007_006. ISBN 978-3-540-73852-7. ^ Costerton JW; Stewart PS; Greenberg EP (May 1999). "Bacterial biofilms: a common cause of persistent infections". Science. 284 (5418): 1318–22. Bibcode:1999Sci...284.1318C. doi:10.1126/science.284.5418.1318. PMID 10334980. ^ Woese CR (March 1994). "There must be a prokaryote somewhere: microbiology's search for itself". Microbiol. Rev. 58 (1): 1–9. PMC 372949 . PMID 8177167. ^ Sapp J (June 2005). "The prokaryote-eukaryote dichotomy: meanings and mythology". Microbiol. Mol. Biol. Rev. 69 (2): 292–305. doi:10.1128/MMBR.69.2.292-305.2005. PMC 1197417 . PMID 15944457. ^ Zimmer C (August 2009). "Origins. On the origin of eukaryotes". Science. 325 (5941): 666–8. doi:10.1126/science.325_666. PMID 19661396. ^ Brown, J.R. (February 2003). "Ancient Horizontal Gene Transfer". Nature Reviews Genetics. 4 (2): 121–132. doi:10.1038/nrg1000. PMID 12560809. ^ Forterre P; Philippe H (October 1999). "Where is the root of the universal tree of life?". BioEssays. 21 (10): 871–9. doi:10.1002/(SICI)1521-1878(199910)21:10<871::AID-BIES10>3.0.CO;2-Q. PMID 10497338. ^ Poole, Anthony; Jeffares, Daniel; Penny, David (September 1999). "Early evolution: prokaryotes, the new kids on the block". BioEssays. 21 (10): 880–9. doi:10.1002/(SICI)1521-1878(199910)21:10<880::AID-BIES11>3.0.CO;2-P. PMID 10497339. ^ Woese C (June 1998). "The universal ancestor". Proc. Natl. Acad. Sci. U.S.A. 95 (12): 6854–9. Bibcode:1998PNAS...95.6854W. doi:10.1073/pnas.95.12.6854. PMC 22660 . PMID 9618502. ^ McKay DS; Gibson EK; Thomas-Keprta KL; et al. (August 1996). "Search for past life on Mars: possible relic biogenic activity in martian meteorite ALH84001". Science. 273 (5277): 924–30. Bibcode:1996Sci...273..924M. doi:10.1126/science.273.5277.924. PMID 8688069. ^ Crenson, Matt (2006-08-06). "After 10 years, few believe life on Mars". Associated Press (on space.com]). Retrieved 2006-08-06. ^ Scott ER (1999). "Origin of carbonate-magnetite-sulfide assemblages in Martian meteorite ALH84001". J. Geophys. Res. 104 (E2): 3803–13. Bibcode:1999JGR...104.3803S. doi:10.1029/1998JE900034. PMID 11542931. ^ Thanbichler M; Wang S; Shapiro L (2005). "The bacterial nucleoid: a highly organized and dynamic structure". J Cell Biochem. 96 (3): 506–21. doi:10.1002/jcb.20519. PMID 15988757. ^ Harold F (1 June 1972). "Conservation and transformation of energy by bacterial membranes". Bacteriol Rev. 36 (2): 172–230. PMC 408323 . PMID 4261111. ^ Shih YL; Rothfield L (2006). "The bacterial cytoskeleton". Microbiol. Mol. Biol. Rev. 70 (3): 729–54. doi:10.1128/MMBR.00017-06. PMC 1594594 . PMID 16959967. ^ Michie KA; Löwe J (2006). "Dynamic filaments of the bacterial cytoskeleton" (PDF). Annu. Rev. Biochem. 75: 467–92. doi:10.1146/annurev.biochem.75.103004.142452. PMID 16756499. Archived from the original (PDF) on November 17, 2006. ^ Santarella-Mellwig, R.; Pruggnaller, S.; Roos, N.; Mattaj, I.; et al. (2013). "Three-Dimensional Reconstruction of Bacteria with a Complex Endomembrane System". PLoS Biology. 11: e1001565. doi:10.1371/journal.pbio.1001565. PMC 3660258 . PMID 23700385. Wikimedia Commons has media related to Procaryota. This page was last modified on 30 December 2016, at 12:48.